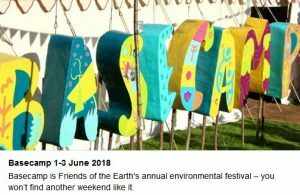 Basecamp is Friends of the Earth’s annual environmental festival. It runs for 3 days and is set in the heart of the stunning Peak District. Tickets for #FoEBasecamp now on sale! Sleep under the stars at a campsite 2 mins away from the venue, equipped with toilets and showers. Please bring your own tent and make sure you’re prepared for any weather. Stay in a male or female dorm onsite at the Youth Hostel or at Hollowford Centre about 5 mins walk away. There’s a limited number of single rooms for people in genuine need. Book a private room in a B&B in Castleton. We run shuttles between the village and the YHA to help with the walking distance. 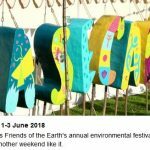 Basecamp is the most family-friendly activist gathering in the UK. We have a full programme of activities for children aged 3 and over, with qualified and DBS-checked staff. And first-aiders are on site. You can attend Basecamp sessions all day, safe in the knowledge that your children are looked after and having a great time. All children’s activities happen around the the main site so you will be able to find them easily at any time. Or you can drop them off in the morning and pick them up at supper time. If you would like to attend but cost is a barrier, Manchester Friends of the Earth has set aside some funds to cover the cost of transport and camping (60 pounds each) for up to five members. Please let us know if you are a member and you would like to apply!